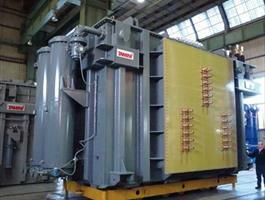 Furnace transformers are used to feed electric arc ovens, which use an electric arc to melt materials. These are special transformers characterized by very high secondary currents and wide secondary voltage regulation (by on-load-tap-changer) in order to cope with the furnace needs, depending on the particular kind of cycle requested. Long-arc steel furnace applications often require the introduction of a reactor targeted to stabilize the arc during fusion in order to improve the performance of the furnace. 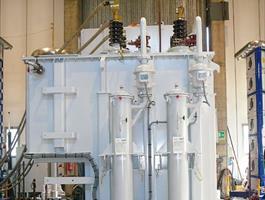 Some customers require an on-load tap changer on the reactor as well as on the electric arc furnace transformer, so that they can achieve flexibility by using both the optimum secondary voltage and impedance values at any time.